This is getting out of hand. 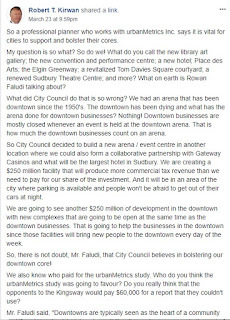 Here we have an elected official - someone who actually gets to vote on the official plan amendment and rezoning applications to permit a new casino and arena on the Kingsway - insist that the existing Sudbury Community Arena has had NO IMPACT on the City's downtown. And the thing is, there isn't much in the way of evidence to contradict what the Councillor says - except for the urbanMetrics report that was released recently that states that the present arena is responsible for generating about 200,000 trips to the core annually. While it defies belief to think that not one of those trips to the arena has generated any economic spin-offs for the downtown (including, presumably, paying for parking at private and municipal lots), the Councillor has dismissed this report out of hand and is actually attacking its author. 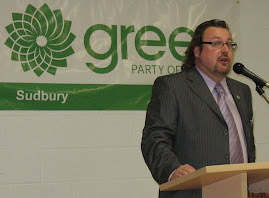 Rowan Faludi, who is an expert in downtown development and revitalization. 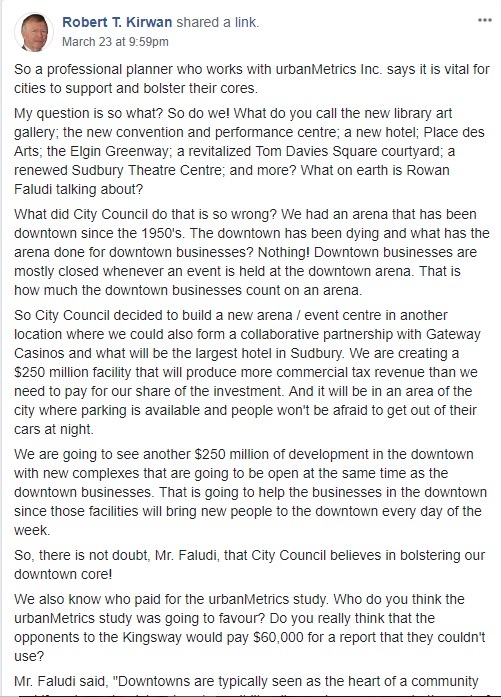 Had the City of Greater Sudbury undertaken its own economic analysis - as required by Section 19 of the Official Plan - before Council approved the location of the arena and entered into a business relationship with Gateway Casinos for the purpose of co-developing the site, we might have a better understanding of what the actual economic impacts of the existing Sudbury Community Arena are, and what economic impacts can be expected by removing this public facility from the downtown in favour of relocating it to an industrial area. 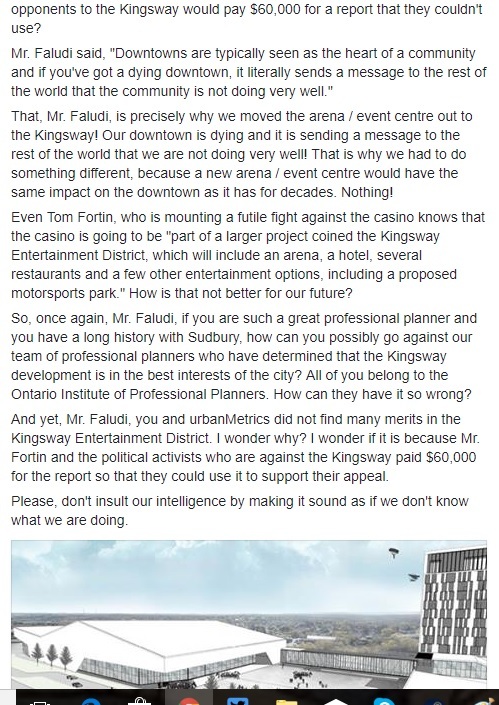 And finally, taking issue with who is paying Mr. Faludi for his professional services, while mentioning nothing of Dillon Consulting and the City's own planning department, despite the existing business relationship the City has with Gateway and landowner Dario Zulich - well, that's completely bizarre. The City has an expressed interest in approving these applications, because it will acquire property at below-market value. And we have Councillors running around insisting that the decision regarding the location of these facilities "has already been made" and those who are now opposing those land use applications are doing so only to sabotage those already-made decisions. Nothing is further from the truth, of course. The decisions haven't been made - but they are about to be made: by a Council who is clearly biased due to the process they themselves created that left the public out of the loop until the last minute, while betraying the City's promise to the public, made via our Official Plan. Yes, I get that Council selected the Kingsway site for the arena back in June, 2017 - but they did so without first obtaining necessary land use approvals. And they've been completely silent on the location of a casino up until now. These land use planning decisions, however, are the ones that matter. If the zoning amendments are ultimately refused, there will be no casino or arena on the Kingsway. This decision process - which is finally one where the public has an opportunity to participate in - is the one that matters. Of course, this member of Council also believes that the only reason people are using their "democratic right" to participate in a statutorily required public process is to "sabotage" the City's decision. That's a truly bizarre lens that an elected official has with regards to public participation and engagement. 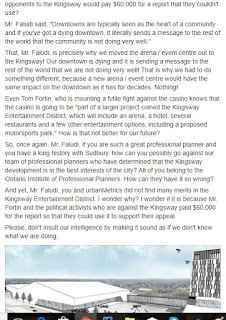 The fact that he thinks the decision to locate the arena and casino on the Kingsway site HAS ALREADY BEEN MADE speaks a lot about just how important this public process is. What kind of City are we living in where experts are ignored and belittled by Councillors and where citizens are threatened and bullied by elected officials? This is shameful and it shouldn't be happening in our community or anywhere else.